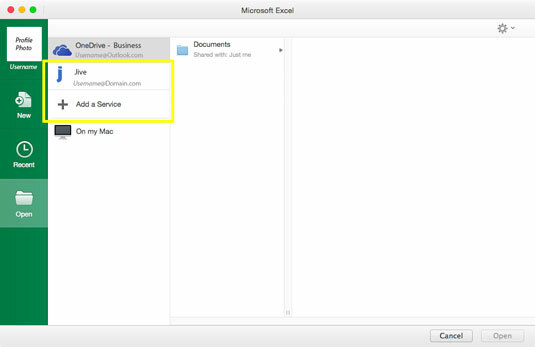 You can now use Jive from within your Microsoft Office 365 applications. Since Jive is a business-class social software solution designed for office environments, it makes all too much sense that in mid-September, 2014, Jive Inc., announced the release of plug-in software that enables the integration of Jive within Microsoft Office 365 applications. What this means for you is that no longer will you have to open the Jive application, but instead you can collaborate, post Jive discussions, and share your files with Jive members from within several of the many Office 365 products that you already use daily. Jive add-ons, such as the connector plug-ins for Office 365, are classified as “commercial software solutions,” and an additional commercial add-on license must be obtained to activate and use the preinstalled plug-ins that came with the original Jive software. Unfortunately, if you want to use this feature, you must contact a member of the Jive sales team to gain paid access. Jive plug-ins come preinstalled when the Jive software is integrated into your workstation or updated plug-ins become available to download after the add-on has been paid for. If your company decides to add Jive integration into Office 365, then you will have the ability to be more productive using less software than previously required. Launch one of the applications via the mobile or the desktop version. The opening page has a list of available templates or file-folders. Within the template/file-folder window on the left side (called a sidebar) your picture and profile will be listed. Below your profile are the options: New, Recent, and Open. Within the main window area are a list of available places to open and save files. If you are a new user and have never set up Jive for use with your Office software, then choose +Add a Service. If you are an existing user, Jive will already be listed; simply click the Jive icon. The image provided shows Microsoft Excel: Mac 2016; however, the process would be similar with all other supported Microsoft Office products. Jive for Microsoft Office: PC 2013 and Microsoft Office: Mac 2016 include plug-ins for all four of the major Office Suite applications (Excel, OneNote, PowerPoint, and Word). This software enhancement was designed to make collaboration with co-workers simpler. Now with Jive you can co-author documents, share spreadsheet reports, get feedback on an upcoming presentation, and collect and manage notes from fellow staff. Since the use of the cloud is essentially what Jive is all about, sadly, no backward compatibility with non-cloud versions of Microsoft Office will ever be made available. Jive for Microsoft OneDrive was designed to share media content such as audio files, images, and videos within your Jive community. When you add content to your OneDrive Jive folder, the content immediately becomes available to all Jive community members, and a posting publishes to Jive indicating that your newly uploaded content is available for viewing. All versions of OneDrive Business are supported; however, none of the OneDrive Personal applications will allow the inclusion of the Jive connector plug-in. Microsoft Outlook is where most of the Jive add-on magic happens. Inside the Outlook application, if the Jive plug-in has been activated, an additional toolbar will be available to add to your window layout. The Jive toolbar has the capability to post discussions, take polls, and view community streams. The toolbar then provide the content from Jive back to you in an email thread format and presents it in an inbox-styled layout. 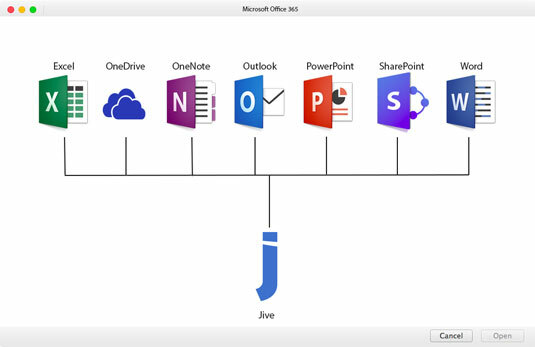 The Jive toolbar for Outlook converts Jive content into emails and creates a separate Jive email account/inbox for you to view and respond to the Jive content coming in without ever having to launch and use the Jive application. The Jive connector for SharePoint allows you to connect your Jive account to your local company’s intranet portal — essentially connecting the two pieces of software. This connection gives you the capability to access the intranet portal your company uses, which would be impossible without the “middle man” (SharePoint) performing the handoff. If you need help connecting SharePoint to the intranet portal and then connecting Jive to SharePoint contact your IT department or computer systems administrator for assistance. Now that you have a good idea of how to integrate Jive into your daily Office 365 routine, you can see whether your company is willing to pay to add the feature to the already installed Jive and Office 365 software at your workstation.